An on-hold system is necessary for any business that takes a high volume of sales calls each and every day. However, an On-Hold System is not only meant to keep your customers on the phone longer. In many cases, the phone call is the gateway to your customer’s overall experience. Have you ever had a client that just started out wrong, and no matter how hard you tried to make it right everything that could go wrong, went wrong? The overall experience is heavily weighted on the initial engagement with your company. Let’s take a look at additional ways to leverage your on-hold system, to better position your customer to have a great experience. Once you have your target demographic narrowed and your awareness strategy decided upon. Create a series of messages that make sense or tell a story. A mixed bag of messages isn’t always the best approach. We can tell them everything, or we can tell them just what they need to know. The goal in this strategy is not to tell them everything, rather, wet their whistle and intrigue the listener enough to ask the phone attendant more questions. The series will prepare the listener for the experience. How do you tell this story? You may want to consider hiring a professional, or take the time to map it out in a storyboard. It is worth taking the time to do this. Choose a professional company to record your on-hold series. A clear voice, with a clear message is stronger and will help get you better results. A front desk attendant may be a good fit, but there should be a recognizable difference from the voice answering the phone and the voice behind the advertising message. 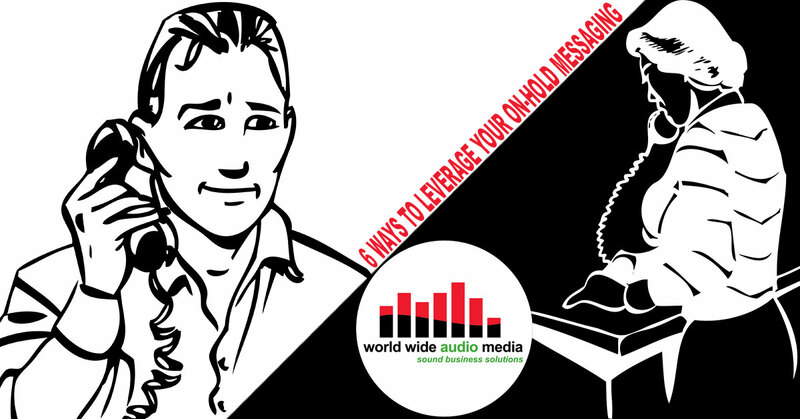 World Wide Audio Media is an industry leader in on-hold messaging systems. Their team consists of several voice-over talents. Each voice talent has been in the radio business for over 25 years. Voice talent is an art, and a well crafted on-hold service will make a big difference in your first impression. World Wide Audio Media is offering 6-months of free service. If you would like a professional team to manage and create your On-Hold Messaging Series, give us a call or send us a message. We would be honored to work with you and your staff.